Yesterday, live on KVOA, I talked about how the balance of omega-6 to omega-3 fats will impact inflammation in our bodies. Omega-6 and omega-3 fats are a direct link to our genes. They are incredibly powerful components of food that literally turn on and off genes that control inflammation, giving us the ability to modify inflammation in our bodies. Chronic inflammation is an independent risk factor for disease. This means that even when everything else looks good, if inflammation is high, you are still at risk. When other risk factors are up, like blood pressure or blood glucose, then inflammation adds to your risk. C-reactive protein (CRP) is a marker of inflammation. It is an important lab test to request in addition to blood pressure, a lipid (cholesterol) panel and blood glucose at your annual check-up. Chronic inflammation is also a component of PCOS, infertility, pregnancy-related complications, digestive problems, lowered immune function, chronic pain, arthritis, depression, difficult weight management and poor recovery from exercise. Even a “beauty diet” centers on reducing inflammation. Inflammation has a negative impact inside and out, mentally and physically, which is why it is very exciting to talk about omega-6 to omega-3 balance. You can redirect genes away from inflammation by reducing omega-6 fat and increasing omega-3 fat in your diet. Check out the KVOA segment. start reading ingredient lists and try this yummy hummus! A few of my co-workers at ProActive tasted the hummus and it got great reviews. “Refreshing!” was one comment. Since edamame, canola oil, lemon juice, ginger and garlic all have anti-inflammatory properties, this is a functional snack that you can feel good about eating. Taste the hummus and add more garlic, ginger, lemon juice and/or soy sauce if needed. 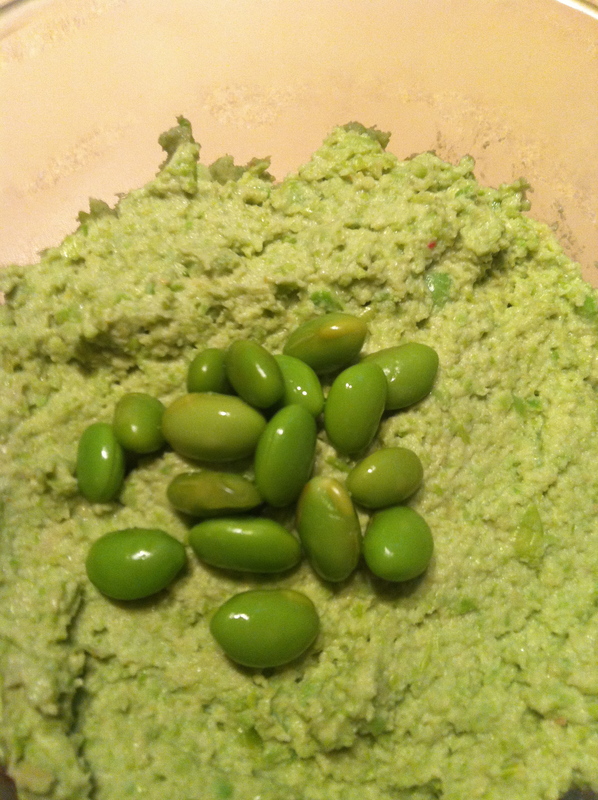 Transfer to a bowl and top with a few edamame beans. Serve with 100% whole grain crackers* or veggie slices. Cucumber, bell pepper and radishes would go great with this hummus, in addition to more traditional carrot sticks. *For gluten-free, use a wheat-free tamari sauce instead of regular soy sauce and use Mary’s Gone Rice crackers. For those who choose to eat gluten, Mary’s Gone crackers are still delicious, and you may also choose from other 100% whole grain crackers and crisp breads, such as Back to Nature Woven Wheats, Ak-Mak, Wasa or Kavli.